It's Real: It's Still Real! 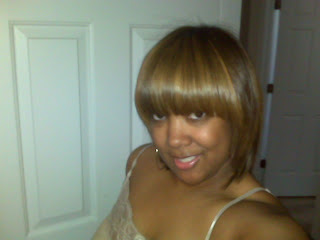 I just had to get a bang!!! Circa 1985 with the Mushroom! It looks good! I can tell you're loving it! 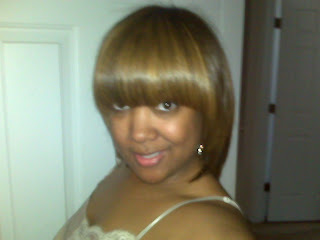 Girl, you are ROCKIN' that color and CUT! I have Sisterlocks that I adore...so I am interested in reading about your story. Without knowing anything about your reasons... my guess is the whole retightening piece especially if you were a DIYer. Anyway... you are lookin' awesome in your "still real" hair. I love your hair, it's beautiful and the color is classy! Cute!!!! How does your hair stay so straight? The humidity doesn't get to it? Regardless, it looks good! your bangs are bangin'. it looks really great! Hi! I'm looking to get Sisterlocks ASAP. One of my concerns is the price because like you, my hair is au naural and I have at least 8 inches. Can you tell me who did you locks as well as your color? Your hair looks great! With & without the locks!! Girl, you are rocking that shroom! I used to wear mine like that in the late 80's. I still love that style. You are TOO fabulous for me! You could wear a purple pixie cut and still be FAB! Freaking out here!!! I went natural and wanted locs never heard of SL until the summer of last yr...a lil late here and I finally found someone with the same hair type as mine with beautiful locks...hair inspiration...but you cut them off!! Oh well you look nice with/without SL. You will still be my SL inspiration! Ahhhh!! Your hair transformation is my inspiration! Currently a student with natural hair I want to change it up but still have the opportunity to go back to rockin' my fro,,,this blog just sealed the deal!!! !